Just outside the medieval city walls, Albergo San Lorenzo is 5 minutes' walk from Grosseto Train Station. Rooms feature air conditioning and a minibar. Wi-Fi is free in all the rooms. Guests here can relax in the spacious lounge which features sofas and an internet point. There is also a bar. San Lorenzo Hotel is around a 10-minute walk from San Francesco Church and Grosseto Cathedral. The nearest beach is 15 km away at Marina di Grosseto. With a stay at Antica Fornace in Grosseto, you'll be within a 15-minute drive of Port of Marina di Grosseto and Forte di San Rocco. This family-friendly residence is 4.4 mi (7 km) from Colonna Romana and 4.4 mi (7.1 km) from Grosseto Cathedral. Make yourself at home in one of the 38 individually decorated guestrooms, featuring kitchens with full-sized refrigerators/freezers and microwaves. Your bed comes with down comforters and premium bedding, and all rooms are furnished with sofa beds. Rooms have private patios. Complimentary wireless Internet access keeps you connected, and satellite programming is available for your entertainment. With a stay at Country Resort Le Due Ruote in Grosseto, you'll be within a 15-minute drive of Villa Granducale di Alberese and Colonna Romana. This farm stay is 5.5 mi (8.8 km) from Natural Park of Maremma and 5.7 mi (9.2 km) from Abbazia di San Rabano. With a stay at this villa in Grosseto, you'll be 7.3 mi (11.8 km) from Colonna Romana and 7.3 mi (11.8 km) from Grosseto Cathedral. 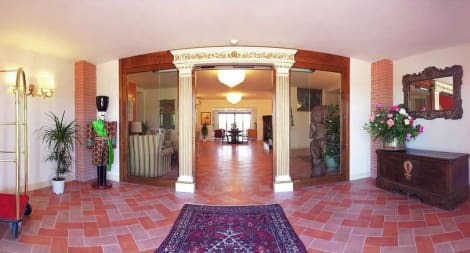 This family-friendly villa is 7.3 mi (11.8 km) from Piazza Dante and 7.3 mi (11.8 km) from Palazzo Comunale di Grosseto. lastminute.com has a fantastic range of hotels in Grosseto, with everything from cheap hotels to luxurious five star accommodation available. We like to live up to our last minute name so remember you can book any one of our excellent Grosseto hotels up until midnight and stay the same night.